UK Apple Cider Vinegar - Raw, Pure, Unpasteurised, Made From Naturally Grown Apples. » What Is Apple Cider Vinegar? Apple Cider Vinegar has been used in cuisine and medicine since ancient times. It is a product of fermented apple juice. Apple Cider Vinegar can be produced in a number of different ways, from the slow going traditional methods that can take over 2 years to the quick 3 month fermentations as used by commercial producers. Our ACV is made the old way, which makes for an authentic, traditional smooth tasting natural product. Apples are well known to be extremely good for us, containing all manner of nutrients, including pectin, vitamins, fibre and minerals, hence the expression "an apple a day keeps the doctor away". » Apple Cider Vinegar - Why is Traditional Better? Many of the apple cider vinegars that you will find in the health food shops and supermarkets have been pasteurised and filtered. This destroys and removes the 'Mother' (a ball of living enzymes that floats in the apple cider vinegar) and other nutrients. Also many of these vinegars are made from apples grown using harmful chemical fertilizers and pesticides. Our Apple Cider Vinegar is made from hand picked, naturally grown apples, and contains absolutely no additives! The ACV is in its natural state, meaning that the 'Mother' is intact. This ball of beneficial living enzymes is rammed with goodness and is largely responsible for many of the beneficial properties of the vinegar. You can get the 'Mother' in your bottle to grow by leaving it in the sunlight. Why is traditional ACV not pasteurised? Naturally grown apples, does that mean organic?? How long will my ACV keep? Is it ok to eat the ‘Mother’? Will taking ACV affect any medications that I am taking? Is Apple Cider Vinegar safe to give to children? Is it safe to take ACV when pregnant? What ingredients is Apple Cider Vinegar made from? I am concerned about plastics, why do you use some plastic containers? How should I take my apple cider vinegar, can I take too much? What is the pH of apple cider vinegar? Cyder Vinegar – Cider Vinegar, what is the difference? It is a traditional product made from freshly crushed, hand picked apples that have been allowed to mature naturally without heat. Unlike all commercial types of ACV, natural apple cider vinegar is not processed or refined and has had nothing added or taken away. Natural ACV is cloudy and contains sediment. It also contains a substance called the ‘mother’ which is naturally produced during the fermentation process. The ‘Mother’ is essentially enzymes, a natural substance created during the fermentation process of ACV. It appears as a cob-web like formation floating in the vinegar. The ‘mother’ is alive and is made up from bacteria, enzymes and living nutrients. Many brands of ACV remove this formation, as to many it would appear that something is wrong with the vinegar. The presence of the mother shows that the vinegar has not been processed or filtered. Pasteurisation is a process that uses heat in order to kill undesirable micro organisms and bacteria that can spoil many consumable liquids. This process also destroys many nutrients and enzymes present in the product. Natural ACV contains anti-bacterial, anti-fungal and anti-viral properties meaning that it is not necessary to pasteurise and doing so would destroy the ‘mother’. The ‘mother’ is largely responsible for the main beneficial effects. Therefore pasteurised and processed apple cider vinegar (which you will find in most health-food shops and supermarkets) will lose many of its desirable health promoting attributes. Naturally grown apples, does that mean organic? Our Apple Cider Vinegar has been produced using the same old traditional methods that have been practised for many hundreds of years. The apples are grown without the use of any chemicals, so no fertilisers or pesticides! They are then gathered by hand and washed in fresh water before pressing in small batches. The process is completely natural and is very similar to organic standards. Nothing is added or taken away and no chemicals are used in any stage of production, from apple blossom to bottling. Because some of the old orchards we use are not certified for organic growing we cannot call our vinegar organic but be rest assured that it is 100% natural and free from additives. Your vinegar cannot ‘go off’. It will mature over time which will improve the flavour and will develop the mother. We allow our Devon ACV to mature for at least three years, while our vintage variety has been maturing for over a decade. It's extra age refines the flavour and it develops a deeper golden colour. Your ACV should be stored in a cool, dark place away from direct sunlight. Light promotes growth of the mother and over time it will continue to form. Our ACV is a natural product and the mother content can vary from bottle to bottle so if you feel you would like more mother in your ACV then you can store it in the light. Otherwise store it in a cupboard and it will keep indefinitely. Yes, the mother is safe to eat. It is recommended that you give your bottle of ACV a shake before use to break up the mother formation to ensure even distribution. Apple cider vinegar is a completely natural product and is essentially just a food. If you are unsure if it is safe to take with medications ask your doctor or other licensed healthcare professional. As above, ACV is just a food. There is no reason why children should avoid consuming apple cider vinegar unless they have been advised by a healthcare professional to specifically not to. ACV has absolutely no side effects and is completely safe to use during / after pregnancy and while breastfeeding. Apples – Natural ACV should be made from nothing but apples. Nothing to be added, and nothing should be taken away (except a little yeast). We have very carefully selected our plastic bottles to only be manufactured from 100% BPA free, non-leaching HDPE. We also offer glass bottles for those of you who still concerned about the use of plastics. Does Cider Vinegar contain alcohol? Properly fermented apple cider vinegar should have a 0% alcohol content. This is why we allow our ACV to ferment naturally for at least two years. 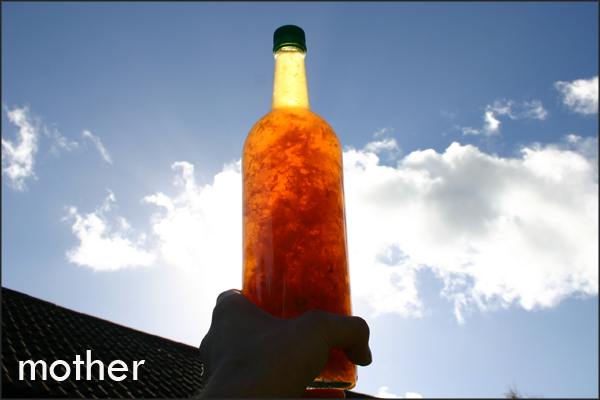 Unlike commercial manufacturers, we don’t rush, taking our time to produce quality traditional vinegar. We recommend taking three dessert spoons of ACV in a little warm water three times daily, at meal times if possible. It is very important to never mix your apple cider vinegar with hot water, as this will effectively pasteurise the vinegar. Taking your ACV undiluted may cause some discomfort for some, so we recommend mixing it with purified water. We often take apple cider neat, straight from a shot glass, we like the no-nonsense approach. However, to start this may be un-comfortable. There are no set limits to the amount of apple cider vinegar you should take daily but drinking too much may make you feel a little queasy due to the detox effect. What is the pH of ACV? As you probably already know, ACV is acidic. Because it is a natural product its pH can vary slightly from year to year. Typically the pH of apple cider vinegar is around 4.50 to 4.75. Although it starts out as an acid, ACV has powerful alkalising effects on the body. See below for more info. The pH of a substance is a measure of its acidity or alkalinity. pH is short for potential of hydrogen and the scale ranges from 0 to 14. Neutral pH is 7 with 0 being the most acidic and 14 is the most alkaline. It is a common misconception that foods that taste acidic are acid forming in the body. In fact some of the most powerful alkalising foods are very acidic. A good example of this are citrus fruits, they have a pH of around 2.5 to 3.5 yet are some of the most alkaline forming foods that you can eat. Cyder and Cider - What is the difference? There is no difference between Apple Cyder Vinegar and Apple Cider Vinegar. 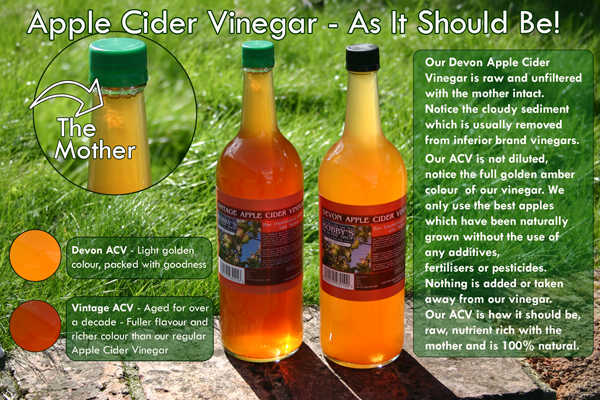 Traditionally ACV has been called both Cyder and Cider vinegar although the method and recipe are the same. Fermented pressed apples. Did you know that there are approximately 7,500 cultivated varieties of apple worldwide? From the Aceymac apple to the Zuccalmaglio's Reinette apple, apple are a great fruit not only for their health benefits but for a whole range of other things too. Apples were traditionally a fruit that were eaten from the end of summer through to late autumn but nowadays apples can be accessed all year round. Today, apples are one of America's most popular fruits with each American eating roughly 65 apples per year. Apples have been known to have been around since primordial times: Archaeologists have evidence of people eating apples as far back as 6500 B.C and it's been proven that sun-dried apples were consumed during the Stone Age. A great deal of Greek and Roman mythology refers to the apple as an emblem for love and beauty. The saying "An apple a day keeps the Doctor away" has a whole lot of truth to it. Apples are a host to a galore of vitamins, minerals, nutrients and healthy compounds that make them a wholesome treat. The fruit contains a cocktail of powerful antioxidants, including phloridzin, catechin, quercetin and chlorogenic acid, protecting the body against certain malignancies, along with preventing kidney stones, fighting inflammation and helping to lower bad choloesterol whilst raising the good kind. In addition, the fact that apples contain pectin, a soluble dietary fibre, helps cholesterol and blood sugar levels, as well as supporting the growth of advantageous bacteria in the digestive tract, not forgetting the high levels of vitamin C (helping to reduce common cold symptoms, certain other malgnancies and fight infections) and vitamin K, which helps to prevent post-menopausal women contracting Osteoporosis. The pectin found in apples provide galacturonic acid to the body. This lowers the body's need for insulin and may help in the management of type 2 diabetes. In Addition, eating an unpeeled apple raw is a good workout for the mouth, providing fibre, a massage for the gums and a mild cleaning for the teeth. At merely 80 calories per medium-sized apple, why not benefit from them as much as possible? There are enough reasons to regard the advice of the aforementioned proverb. There are alot of myths about how the seeds from an apple are poisonous, when in fact; they are equally beneficial to the apple itself. It's said that the amount of cyanide in apple pips is enough to make someone ill but when apples are pressed commercially for juice and cider, the pips are also shredded or pressed. Nobody ever removed the seeds and that's a good thing. Many people don't eat down to the core when eating an apple and they're missing out on a significant measure of healthy, hearty components, including amino acids, minerals and beneficial fatty acids. Over the last 100+ years, apple seeds have been suggested and used by some to treat a number of health ailments. They contain a whole load of beneficial ingredients and have a few uses you wouldn't expect, such as their use in cosmetics, aromatherapy compounds and shampoos. Apple seeds contain 720mg of Phosphorus and 210mg of Calcium. We cannot be held responsible for the content owned and updated by external websites. I have been searching for apple cider vinegar with the mother for a while, especially in a glass bottle, most peoplem are unaware of the mounting evidence of serious toxins in plastic bottles etc. Thank you for the excellent packaging and prompt delivery. Keep up the good work guys. Warm regards Mike Hughes, London. I've had gout for over 35 years, and until a year ago took an Allopurinol tablet daily to keep the excess uric acid under control so that I could live a normal life. A year ago someone suggested using Apple Cider Vinegar instead, and although I was sceptical I decided to try it. I started on two small doses daily, but now take one large dose in the morning, with warm water and honey. I haven't touched Allopurinol for 12 months. GPs should ignore Allopurinol in their drug manuals and become aware of the properties of ACV and the benefits it can give. It is so nice to see such various items of Apple Cider Vinegar.so it is easy for my mothers to choose the actual vinegar.i know it is strong medicine for our health.they mostly helpful for cancer patient.Thank you for the providing such excellent packaging and prompt delivery. Keep up the good work guys. I have today ordered the ACV and on reading the information was wondering whether it can help with under active thyroid. I am not taking thyroxin and refuse to do this, as I am very anti- medication. I am looking for a way to normalise my thyroid naturally. Many thanks. Je suis a la recherche d'une boutique pour acheter ce vinaigre de cidre de pomme avec la mère par internet. PLEASE LET ME KNOW IF YOU CAN SHIP "APPLE CIDER VINEGER" AND "HYDROGEN PEROXIDE" TO INDIA.WHAT IS THE BEST WAY TO GET. Is it possible to collect ACV from you as we will be travelling through Devon to Cornwall in May. Where can I find your answers to the above questions? as a matter of interest, taking a very small dose of acv every day precludes the use of medication for Gout, halleluja. I gathered from you that acv had a profound effect on Bobby and indeed saved his life from multiple strains of cancer. Acv has also cleared my blood vessels of the build up of colesterol, what else can it be used for? Acne, Warts, Candida, Alkalizing and a general health tonic of vintamins and minerals I guess. Is cyder vinegar benificial muscle cramps? amazing produce would deffo recommend this sight to anyone ! I have been buying cider vinegar Aspall brand (UK)In the 25 ltr plastic container for years,no mother forms in storage however as soon as I transfer it into a large glass container it forms a thick mother over the top. When transferred to a smaller plastic dispenser again it stops forming a mother. If a chemical leaching is inhibiting the formation of a mother in cider should the keeping of cider vinegar be avoided? Tava tea is becoming very popular all over the world as people are exposed to information about its high antioxidant content and the way that it helps you to lose weight and burn fat. Many people use this drink to lose weight, and it has also been shown to help clear up your skin. Looking over the tava tea reviews, it seems like a lot of people are hopping on the bandwagon to agree that it was useful for them. I have been taking 2 tbs of your AVC with honey in warm water twice a day for the past 3 weeks. I was absolutely amazed at the speed at which my joints started to improve. I have osteoarthritis in my hip, shoulder and knees. Within a matter of days the stiffness and pain in my shoulder had gone completely. My knees are now almost pain free and I can walk up and down stairs and get up from sitting much more easily. The effect of the arthritis in my hip is more severe (I need a hip replacement) but there is definitely an improvment, especially given the wet weather we have been having, which would normally have made my hip very stiff and painful. I have also noticed that I do not get indigestion any more and I have even lost 3lbs in weight due to being less hungry and so less inclined to snack. What an amazing product. Thanks so much. I would like to cure my own apple vinegar in a gallon oak barrel. Should I be concerned with the oak barrel molding? Should I start it in a glass crock first with your vinegar and mother? Does that mean i must stop taking ACV? You caution about never adding ACV to hot water under you "...can I take too much ACV" section but then you say add molasses for a warm drink, isn't this a contradiction? You should never add ACV to boiling or very hot water as will will kill the mother, but warm water is just fine. Hope that helps. What effect would straight ACV have on tooth enamel? ACV badly affects tooth enamel. Use a straw and do not rinse your mouth straight after its use. This article mentions sixty health benefits of apple cider vinegar. Can ACV help get rid of acid reflux? how can ACV get rid of Gallstone? Which acv best for mixing with honey to make proven beneficial eye drops ? The last three 1 litre plastic bottles I bought were all light golden in colour but there was no sign of mother, even though the second and third were kept on the kitchen windowsill (facing east, in Glasgow)until I used them. What I want to know is whether the mother is still present even though there is no apparent sign of it? Up until this last batch, I was able to see the mother, sometimes a lot and other times just a very little. Many thanks. Is it possible to have your product ACV shipped to Spain, where I live? I cannot take liquids on a plane so am wondering how I can get it from the U.K. to Spain. I started two glass jars of vinegar. One with apples and left over "mother". The other with guava and left over vinegar. 1. How (or what) do I do when I have used the liqiuid in the jars? 2. Is the guava vinegar just as healthy as the apple ?? Unfortunately, questions asked on the 'comments' section of the website do not get through to the right people. Please use the 'contact us' button at the top of the webpage.